Rent The Rock! : Rent the Rock! 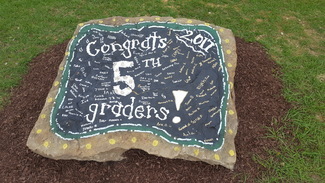 The Apex Elementary Spirit Rock is a great way to send a message for all to see! Congratulate your favorite student on an accomplishment, wish a student a Happy Birthday, show appreciation to your favorite teacher or staff member, celebrate a team win or let everyone know how much you love our school! The rock is available for weekly rental to families and staff of AES for their use and enjoyment. Reserve the Spirit Rock for only $20.00 per week! All proceeds will go directly back to AES through our PTA. 1.Weekly Rental (Saturday-Friday) painted on Saturday or Sunday. 2. As soon as you select your date, you have ONE week to send in payment. Checks can be made out to Apex Elementary PTA. Please send to school in an envelope marked "SPIRIT ROCK". If you don't pay in the allotted time, your name will be removed from the sign up. 3.Rental is on a 1st come 1st serve basis. Scheduling made through PTA. 4.Renter supplies all paint and supplies needed and message must be approved prior to painting. *** Cover prior message before painting. Some supplies and colors may be available through the PTA. Inquire upon rental as to what is available. 5.Keep areas around the rock clean and neat while painting. 6.NO profane words, symbols or any derogatory or offensive messages will be permitted on the rock. The AES PTA reserves the right to remove any such messages. AES PTA is not responsible for parents, students or others who paint the rock without reserving it and the artwork will be promptly covered. AES also reserves the rights to block out dates to be used by the school and PTA. I likely won’t paint until Wednesday night, as a surprise for Thursday.